Andy H: This weeks pull seems a little lighter than usual (could give me time to catch up over the Christmas break!) but still enough good reading to be had. 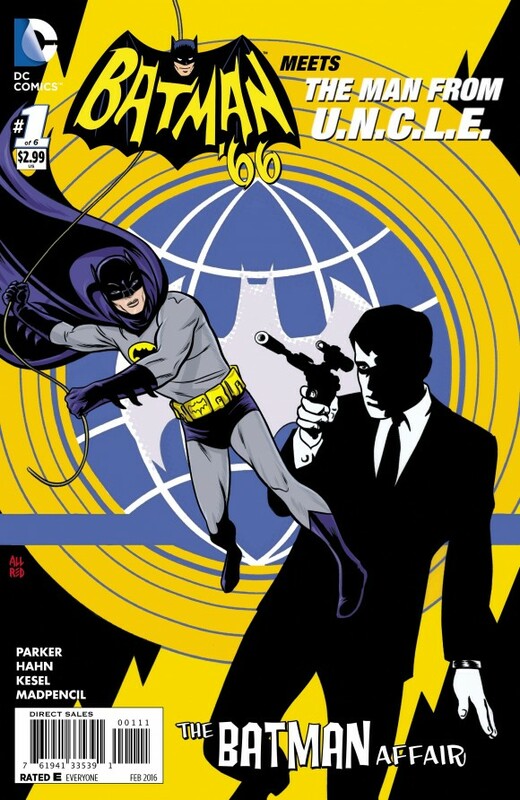 First out of the gate is Batman '66 Meets The Man from U.N.C.L.E. #1. Two iconic '60s kitsch TV series meet headlong in comics. Batman '66, as a comic, has gone down really well over the last few years and I hope this six-part miniseries continues the trend. Seeing agents Napoleon Solo and Illya Kuryakin join forces with the Dynamic Duo should be fun. Returning to comics for the first time in a while is the Rocketeer in the four-part Rocketeer At War. I don't know that I would read an ongoing series with this character but the minis keep me coming back for more, and just seem to keep things that bit fresher. It's 1942 and our jetpack-wearing hero is going to war (as the title suggests). The mainstay for the series in the past has been the art and hopefully the retro style will be here again and I believe artist Dave Bullock should deliver. Vertigo have recently been knocking out some decent titles and The Last Gang In Town could be another one. Third title on this weeks pull that is a miniseries. Written by Simon Oliver with art by Rufus Dayglo (recently did a great stint on 'Bad Company' in 2000 AD) this story starts in the '70s and moves through the decades. There's a tagline in there, somewhere, about being driven by destiny and cheap cider! Well that sold it for me. Back after its recent hiatus is Deadly Class. Another winner from Image Comics. Along with Manifest Destiny, Birthright and Southern Bastards, this title just leaves you wanting more. A reminder why Rick Remender is such a good writer. Also out this week is Dark Knight III: The Master Race #2. I don't think the debut set the comic world alight but it did enough for me to come back for more. Happy Christmas reading folks. Yup, as appears to be the standard these days, the comic publishers have done their best to get as many quality titles out of the door before the festive break - and a sneaky peak and next Wednesday's listings actually seems to be just as packed! Of the new books on the stands I'm excited to finally get my hands on Venus #1 which I picked out for Ten Forward a couple of months back. Space-based science fiction is, of course, finding something of a boom at present what with The Martian reaching cinema audiences earlier this year and now a small indie pic that JJ Abrams directed hitting screens. I wasn't overly impressed with Faster Than Light when that came out from Image, but I've hopes that the BOOM! released Venus will strike a chord. The other debut on my radar is Patsy Walker A.K.A Hellcat #1 purely because she was a fine comedy edition to Charles Soule's She-Hulk series a while back and I'm intrigued to see what sort of feel Kate Leth brings to Patsy's adventures. On the subject of Marvel books I'll be giving second looks to Daredevil and Spider-Woman this week, the former needing a strong follow up to keep me interested and the latter a fairly safe purchase since I think Dennis Hopeless has been doing a fine job with Jessica Drew's story since he took charge. Fairly safe by now is Extraordinary X-Men with #4 out tomorrow while I'm still not sitting comfortably with Amazing Spider-Man on my pull-list presently. I'll be five issues deep by the time Wednesday closes its doors and Slott is managing to find a weird balance of strong, nostalgic familiarity with an unsettled globetrotting nature that has me quite conflicted about the title. I have to say that I have no doubts whatsoever when it comes to Donny Cates Paybacks #4 showing up this week as it's by far one of my favourite books at the moment and I cannot wait to see what superhero chaos ensues!